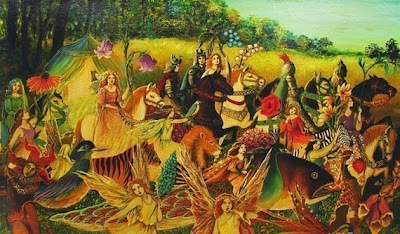 We are pleased to begin our new monthly Artist Portrait Series by sharing with you a wonderful interview that I conducted recently with artist Emily Balivet. A fine artist/illustrator living in Vermont, Balivet's work explores the mystical feminine elements of ancient goddess mythologies from around the world through style that reflects her interest in Art Nouveau and the pre Raphaelite movements. The result? Strong, confident women focused through a painter's lens of exquisite color and grace. MBS: Can you tell us a little bit about how you got started as an artist? I know you are self taught, but how did your career develop from something you loved to do to pursuing it actively as a career? Emily: I was 17 when discovered spending hours upon hours creating things was completely fulfilling and I made a decision to make a career of my art. In 1991 I began marketing my random creations in the craft fair/festival circuit and wholesaling to shops near and far, but nearly always as a supplement to my income. I dabbled in a variety of mediums (woodworking, textile art, silk screening, candle making, jewelry, etc.). However, my big big love was painting (with acrylics) and I painted daily for years without ever displaying my "real art" to the public. Perhaps I felt my skills weren't developed enough or maybe I was too emotionally attached. In 2004 I busted through some psychological barriers and began marketing my artwork online....and it's been a fantastic life ever since! Not only have I been able to make a living doing what I love, but the fears and attachment I once felt about my art quickly dissolved. It's the feeling you get when you know you're doing exactly what you were made to do! 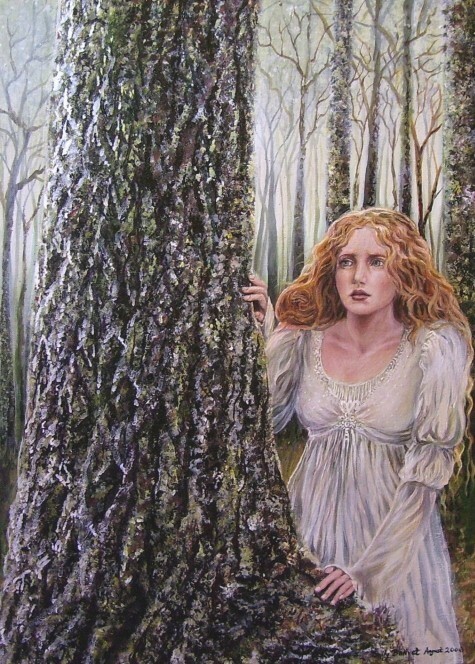 I've noticed that the themes explored in your paintings revolve primarily around Goddess and Mythological subjects. How did this evolve into such a focal point for your work? 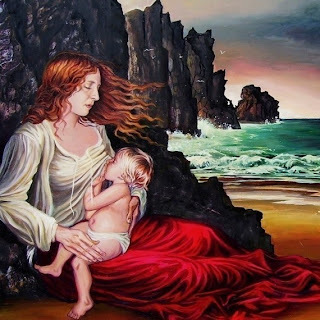 "The Lap- Breastfeeding Mother Ocean Goddess"
Do you work in a series? And if so, can you tell us a little bit about the one you're currently working on? 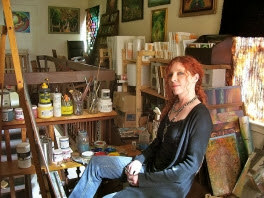 Emily: I most often have a number of projects going, some individual paintings and some that work into a series. I have the Medieval Alphabet, a tarot deck (not yet published), and a few other projects including book illustrations. In fact, I'm currently in the early stages of illustrating a children's story by Vermont author, Tanya Sousa. Wow...wonderful! Sounds like you are pretty busy. Can you tell us a little about the tarot deck you are working on? The imagery. Emily: The imagery of my deck is fairly classical and in quite a similar style as my Medieval Alphabet. However, after completing it and sitting on it for a while, I've decided I need to repaint several cards before publishing. In fact I may make some major changes to the entire project! 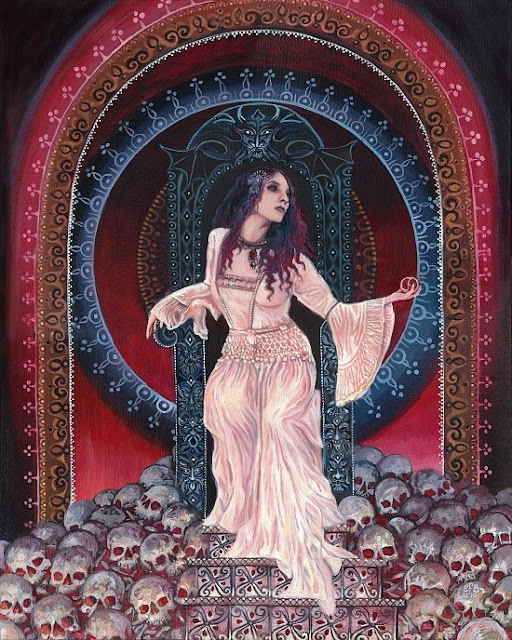 ... Make it more powerful, more my own, and enhance the symbolic imagery I'm looking for in a deck. It's very important to me that this particular project turns out just right! "Persephone- Queen of the Underworld"
Emily: My main medium is acrylics though I do enjoy oils as well. Before I began marketing my work on the web, I used to work on much larger canvases and Masonite panels. Considering the cost and difficulty shipping larger works involves, I've since switched to smaller pieces, 20x24 usually being the largest. 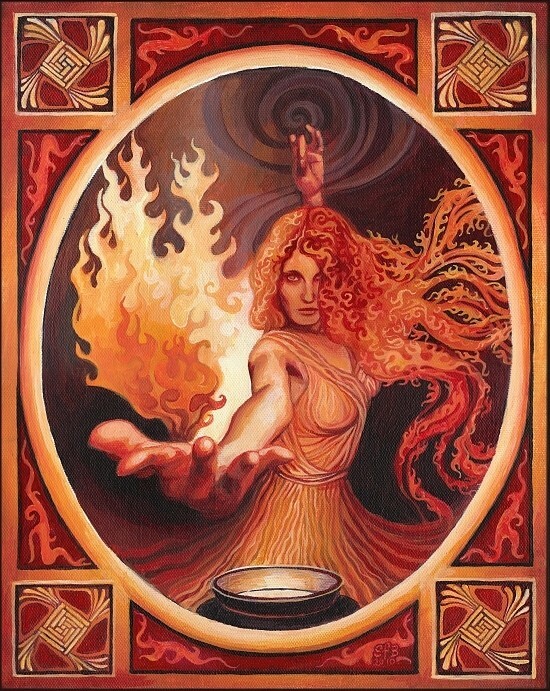 "Brigid- Celtic Goddess of Inspiration"
What is a typical work day for you? Do you keep "hours" and go to work painting like a 9-5 job? Or are you less scheduled about it? Emily: Oh, much less scheduled than a regular 9-5 job. I like to stay up until the wee hours of the morning painting, but I also like to wake up in the wee hours of the morning to paint! This means that I'm often switching sleeping patterns to have the best of both worlds. The most amazing things occur in my mind at night! (Possibly a side effect from being raised in Alaska and enduring months of darkness)! I have kind of a nuts and bolts question next. A lot of times one of the hardest things an artist finds is trying to maintain a balance between doing their creative work and having to tend to business...paperwork, promoting themselves etc. Since you expanded your business by putting it online, how do you handle this and what advice can you give to other artists who are looking to branch out in a big way? Emily: The business aspect certainly did not come naturally to me. For many years I thought I needed an agent or someone to work behind the scenes, making connections, marketing, etc. When I began taking on those tasks myself I discovered that every small step I took made a huge difference and (to my surprise) I sometimes enjoyed the business end of things! Having been a freelance artist for a number of years now, I've learned to distinguish between these two very opposing urges in my mind. Some days I wake up with a lack of enthusiasm for my painting, but with a crazy desire to go over inventory or post new paintings around the web. I've learned to go with the flow when the mood strikes. If I miss the opportunity, doing the marketing when I MUST is like pulling teeth for me! As for what advice I would give other artists? Post your art to as many sites as you can handle. I honestly believe there is a buyer out there for every piece of art. The art and the buyer just need to be connected, so make it as easy as possible for your art to be seen! That sounds like very wise advise. Thank you so much for spending time with us and we're looking forward to seeing your new work when it's published! Prints of Emily's work and also some her original paintings are available in her Etsy Shop. Such gorgeous art from such a beautiful and dynamic artist. Thank you for sharing your art with the world, Emily! It's truly a feast for the eyes.